The last time I competed it was at 2008 Adult Nationals and in that time adult competition has not really changed but, oh man, my body definitely did! Seven years ago I did not have to conserve energy on practice ice an hour and a half before I competed. I did not have to stretch and restretch before and after practice sessions and again, just before the competition. And I definitely did not have to carefully monitor the swelling behind my bad knee just before I went on warm up. With all this though, one thing did not change about competing. I loved it. I absolutely loved stepping on the empty ice to compete in front of a crowd of people (small but nevertheless a crowd) and of course, the judges. The judges in a competition are incidental to me, they are part of the crowd, another area of the arena to impress. Unlike a test, where the goal is to pass, in a competition I’m essentially trying to outperform myself and others as well as interpret the music to the absolute fullest. It’s why I love skating so much. That exhibitionist part of me just loves, loves, LOVES, putting on a show, pretending that I am better then I am and exceeding my physical limitations. This time was no different, it wasn’t a perfect performance by any means but the feeling of just pure adrenaline and enjoyment as I stepped out on the ice to challenge myself to not be afraid, perform and to really put my skills to the test is exactly why I wanted to compete again. Overall, I placed 4th in the Bronze Freeskate and 2nd in Bronze Compulsory. I think it was a good showing considering I didn’t start training for it until 6 weeks ago. I had a few “uh oh” moments during my freeskate which I wish I could take back but overall it was a solid skate. I shoved my toe pick in the ice coming down from the camel into the sit spin and I had a very wobbly catch foot spin from my sit. My flip was probably the tiniest flip I have ever done without actually falling on it and I was so annoyed by the missed sit spin that I forgot where I was for a second in my foot work. That aside, the performance was good. I remember thinking during the program that if I smiled anymore my face would break. I just could not stop! I actually saw two skaters that I had competed against in 2008 in the locker rooms. Skating is such a small, small world. 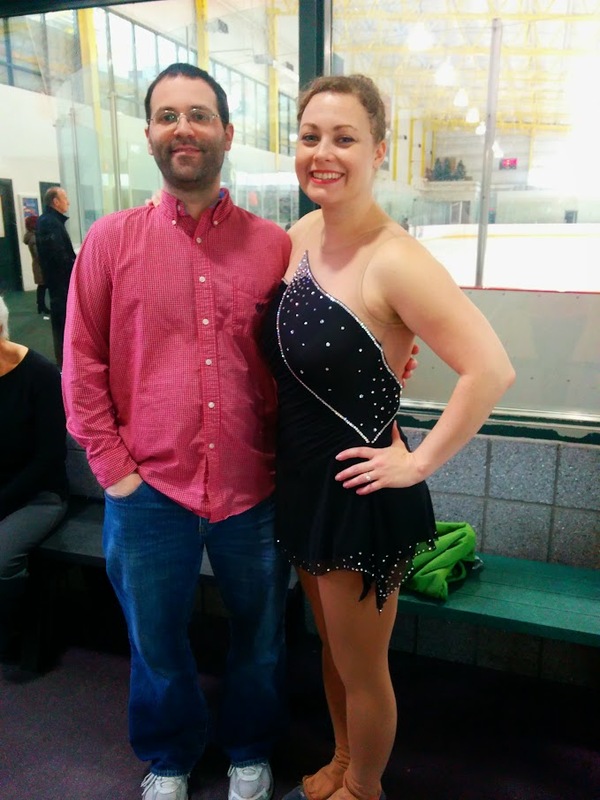 I also met a few new people both in the stands and while waiting to take the ice for competition. I met another skater up in the stands throwing rubber duckies at the sweepers ( for the skaters ; ) and sipping wine from the bottle. My fiance was slightly disturbed, I thought it was hilarious. They were rubber ducks, no one was going to get hurt except for maybe the ducks! For anyone, who has not competed at any adult competition I would encourage you to try it out just for fun. Not everyone enjoys exhibiting themselves in front of a crowd but the camaraderie among the other skaters as well as the chance to feel just a tiny bit like your favorite skaters on tv is definitely worth it. There is no pass or fail in a competition and I can honestly say that it will probably make you a better skater overall. Plus, you get to wear a really sparkly costume which obviously makes everything better! I promise it’s not at all like testing and the worst that can happen is that people pelt you with a rubber duck. How can anyone say no to that?